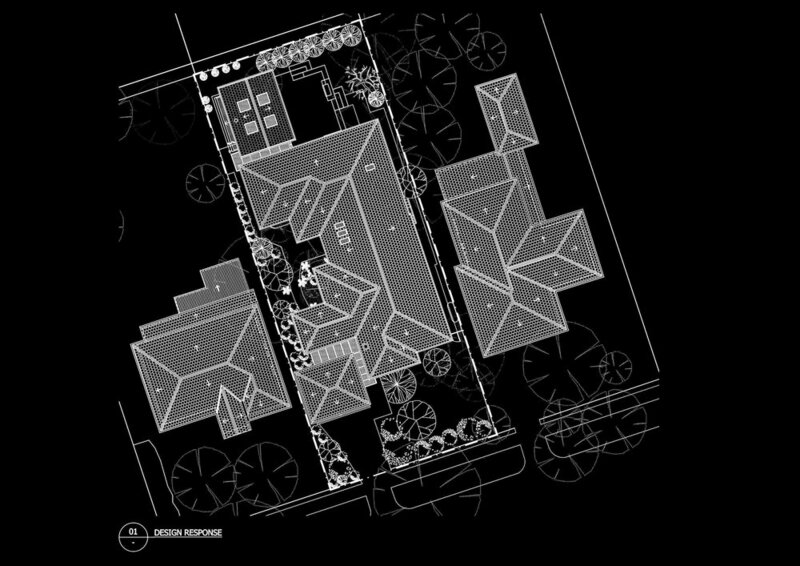 THE CLIENT’S BRIEF TO OUR STUDIO WAS TO RESTORE AND ADD A NEW EXTENSION TO AN EXISTING SINGLE STOREY 1930’S INTERWAR PERIOD FREESTANDING HOUSE IN ONE OF THE FIRST MELBOURNE SUBURBS TO BE DEVELOPED ACCORDING TO THE PATTERN OF POST-WAR SUBURBIA. THE EXISTING PROPERTY IS ALSO UNDER A HERITAGE OVERLAY. THE SCOPE OF THE EXTENSION WORK INCLUDED PROVIDING A SINGLE LEVEL INDOOR-OUTDOOR LIVING SPACE WITH A NEW SPACIOUS OUTDOOR ENTERTAINING AREA ON THE NORTHERN REAR PART OF THE SITE AS OUR CLIENTS OFTEN ENTERTAIN A LARGE NUMBER OF PEOPLE. - THE ORIGINAL 1930’S WHICH HOUSES THE ENTRY, LOUNGE, DINING, 2 BEDROOMS AND A BATHROOM. - AND THE REAR SECTION PART OF THE PROPERTY WHICH HOUSES THE KITCHEN, STUDY, FAMILY, LAUNDRY, A BATHROOM, 2 BEDROOMS AND THE OUTDOOR AREA. MOST OF THESE ROOMS WERE ADDED AFTER THE MID 1980’S WHERE THE EXTERNAL WALLS ARE RENDERED BRICK VENEER WITH STUD WALLS ON THE INSIDE. THE EXISTING REAR TIMBER DECKING WAS IN AN UNSAFE CONDITION AND UNABLE TO BE USED FOR ENTERTAINING. SOME OF THE TIMBER BOARDS HAD DETERIORATED BADLY THROUGH TIME AND ALSO LACK OF MAINTENANCE. THERE WAS A SUNKEN SITTING AREA WHICH WAS QUITE POPULAR BACK THEN WITH PAINTED TIMBER RAILINGS STATING THE DIVISION BETWEEN THAT SPACE OF THE KITCHEN AND BREAKFAST AREAS. THE LEVEL SURVEY SHOWS THAT THE LAND WAS GRADUALLY GETTING LOWER TOWARDS THE BACK OF THE PROPERTY AND WITH INADEQUATE STORM WATER DRAINAGE TO HANDLE A HEAVY MELBOURNE RAIN WHICH SOMETIMES HAPPENS IN WINTER. THIS HAD CAUSED FLOODING TO THE SUNKEN SITTING AREA AT LEAST TWICE IN THE PAST. DURING THE CONSTRUCTION PHASE THE BUILDER FOUND ENORMOUS PROBLEMS WITH ROTTEN TIMBER STUMPS AND FLOOR JOISTS UNDER THE EXISTING TIMBER FLOOR IN THE ORIGINAL PART OF THE HOUSE. RAISING THE FLOOR LEVEL OF THE SUNKEN SITTING AREA TO MATCH WITH THE REST OF THE HIGHER EXISTING FLOOR LEVEL WAS PART OF OUR CONCEPT DESIGN TO CREATE A SPACIOUS OPEN PLAN INDOOR OUTDOOR AREA. WORKING TOGETHER WITH THE STRUCTURAL ENGINEER, WE THEN CHANGED THE DIRECTION OF THE FALL ON THE WESTERN TERRACE SO ANY WATER WILL RUN IN THE OPPOSITE DIRECTION AND AWAY FROM THE BUILDING. 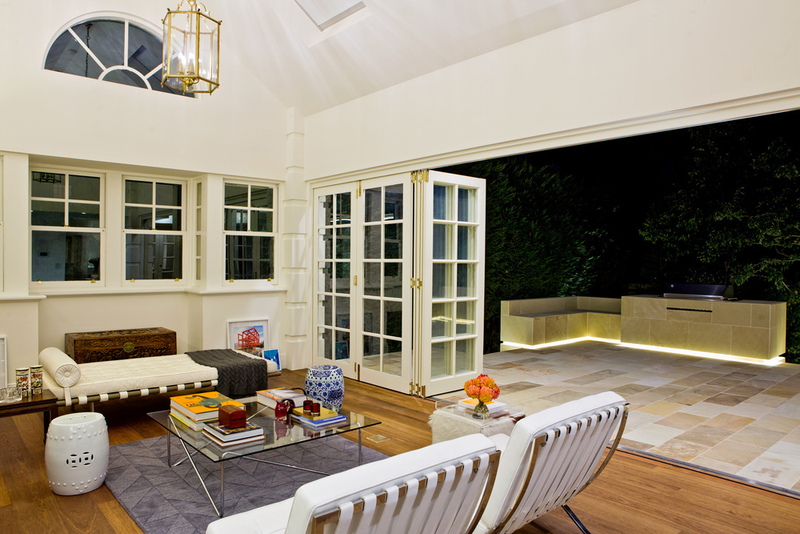 BY CHANGING DIRECTION OF THE FALL, WE CREATED A SEAMLESS MARRIAGE BETWEEN INDOOR AND THE NEW OUTDOOR LIVING AREAS. A NEW HEATING AND COOLING SYSTEM WAS DESIGNED TO ACCOMMODATE THE REAR NEW EXTENSION AS WELL AS FIXING THE HEATING PROBLEM TO THE FRONT PART OF THE HOUSE. WE THEN CREATED SEPARATION BETWEEN THE FRONT AND THE REAR PART OF THE HOUSE BY INTRODUCING A FULL HEIGHT GLASS DOOR AT THE END OF THE HALLWAY TO ZONE THESE TWO AREAS SEPARATELY. THE SIMILAR TREATMENT WAS USED ON THE STRUCTURAL COLUMNS AS WELL. THE TERRACOTTA ROOF TILES WERE SOURCED TO MATCH THE EXISTING. THE END RESULT SHOWS THAT THE NEW EXTENSION AT REAR HAS ALWAYS BEEN THERE AS PART OF THE EXISTING DWELLING. THE EXISTING 1980’S KITCHEN JOINERY WAS COMPLETELY REPLACED, WITH THE NEW DESIGN INCLUDING PLENTY OF STORAGE FOR THE CLIENT. THE NEW SEMI WALK-IN PANTRY HAS FULL HEIGHT SLIDING DOORS WHICH ACCENTUATE AND ALSO CELEBRATE THE HEIGHT OF THE EXISTING CEILING. THE INTERNAL WALL IN THE NEW EXTENSION IS CAREFULLY DESIGNED IN SUCH WAY TO DISCRETELY MINIMISE DOORS TO A STORE ROOM, A BATHROOM AND A MINI BAR. WE ALSO FINALLY CONVINCED THE CLIENT INTO USING A WHITER AND BRIGHTER COLOUR TO THE WALLS COMPARED TO THE EXISTING ONE IN THE INTERIOR IN ORDER TO GIVE AN AIRY, LIGHTER AND SPACIOUS FEELING. THE WHITE WALLS ALSO GIVE A GREAT COMPLIMENT THE NEW OAK WIDE PLANK TIMBER FLOOR. WE ALSO INTEGRATED A NEW BARBEQUE TO THE NEW NORTHERN TERRACE WHICH THE CLIENT ORIGINALLY DIDN’T WANT BECAUSE HE IS NOT INTERESTED IN BARBECUING. HOWEVER WE BELIEVE USE OF THIS AREA WILL GRADUALLY CHANGE WITH TIME. "AT ALL TIMES SWG IMPRESSED US AS BEING VERY PROFESSIONAL, EXTREMELY INNOVATIVE IN THEIR DESIGNS AND VERY EASY TO WORK WITH. THE QUALITY OF THEIR DRAWINGS, DOCUMENTATION AND WORKMANSHIP HAS BEEN EXEMPLARY. THE DESIGN AND QUALITY OF THE FINISHED PRODUCT IS OUTSTANDING WITH THE ATTENTION TO DESIGN DETAIL RESULTING IN A HOUSE THAT IS A JOY TO LIVE IN. THE FINISHED PRODUCT HAS DRAWN VERY FAVOURABLE COMMENT FROM OUR FRIENDS AND ACQUAINTANCES......"
PLEASE VISIT SWG STUDIO LINKEDIN PROFILE FOR FURTHER DETAIL OF MR. EGAN'S ENDORSEMENT.